Murunga Keerai or Moringa leaf is best known as an excellent source of nutrition and natural energy booster. I make many dishes out of this leaf considering its health benefits. We get this generally in shops in Little India , Singapore and whenever I go for shopping I make it a point to buy this. This post is about Moringa leaves (Drumstick Leaves) cooked with freshly grated coconut, palm sugar palm sugar and tempering at the end with spices from our kitchen. 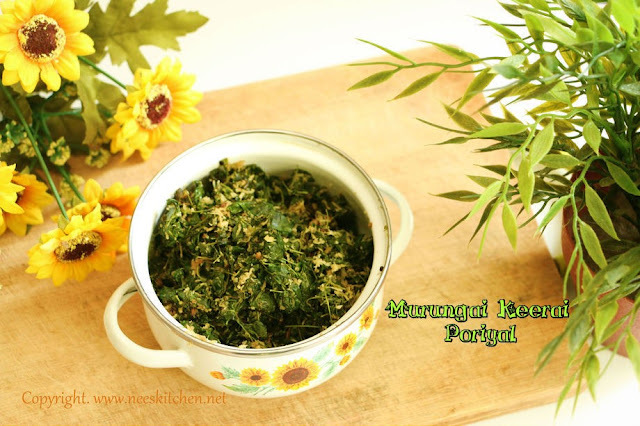 One quick dish which I make often is the Murunga Keerai Poriyal or (Moringa leaves Curry). Initially I never used to put palm sugar earlier due to which my kid used to run away whenever she sees this in her plate. So to make her eat the dish I started adding palm sugar and it was tasting much better than earlier. I also am particular on using claypot for this recipe as it will retain all the minerals and nutrients in the leaves. Moringa / Murunga Keerai Tea - I have also mentioned how to store it for long term in places where it is not available throughout the year. 1. Separate the leaves and stem from the murunga keerai (Moringa leaves) bunch. We need only the leaves. 3. Take a cooking pan, preferable claypot to retain all the nutrients and add oil. 4. Add hing, mustard, urad dhal, cumin seeds and dry chili. 5. Once fried add the spinach and salt. 6. Sauté for few minutes. Let it cook completely, it would reduce by half. 7. Add Palm sugar when the quantity becomes half. 8. Switch of the flame and add coconut and sauté for few seconds. 1. Adding palm sugar is optional. 2. Coconut & Palm Sugar can be added immediately after the gas is switched off to get a good taste.